Sound familiar? Most corporate CRM’s don’t align with their business processes. The net result is that sales operations don’t get the “bang for the buck” they anticipated, nor do they achieve predicted sales goals and productivity gains. Watch the video @ Adventace SMS. We help our cients Create the High Performance Sales Environment® through our holistic, end-to-end sales and sales management methodology. This methodology delivers predictable results, measurable and sustainable performance improvement, and confidence that expected results can be achieved. Historically our clients have outperformed past results by a factor of at least 2 to 1. Through partnership with Salesforce.com and their AppExchange, we have automated our entire methodology into the Adventace Sales Management System (SMS). This application is a complete, end-to-end sales management system. 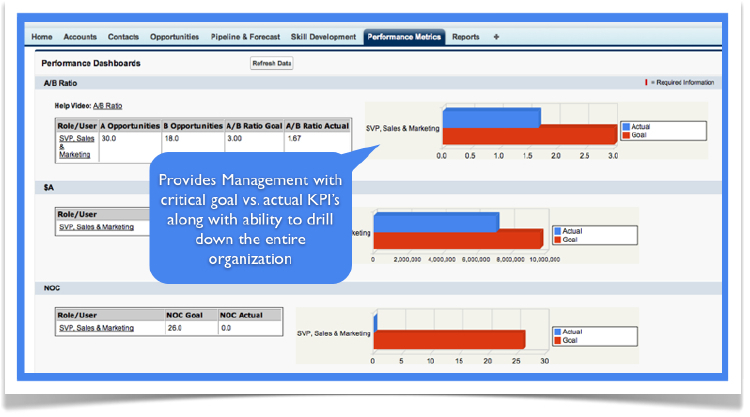 It helps executives better drive their entire sales operation top-down through use of key leading performance metrics. It helps sales managers better manage sales people and improve their skills, while running a better operation. Its expert functions make it an indispensable differentiator and time saver for sales people, allowing them to generate key buyer deliverables in minutes while better managing their opportunities. Skill Development: Complete skill development systems are provided to help sellers, sales managers, channel managers, and senior sales managers. Here, managers grade an individual in each key skill related to their job function. SMS then provides Personal Development Plans to help managers measurably improve an individual’s performance, helping to unlock their potential.